Dr. Silvia Correale, Who is she? The Postulator for the Cause of the Servant of God Luisa Piccarreta. Born in Argentina 46 years ago, Dr. Silvia Correale also holds Italian nationality. She is a lawyer by profession, and a Doctor in Canon Law. In order to declare someone a saint, the Church launches an intense investigation that can take years. During this time, a postulator examines whether or not the candidate really lived like a hero of christian virtue. 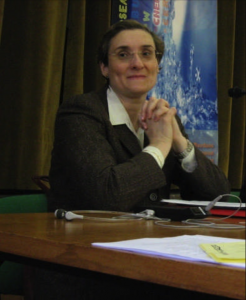 Dr. Correla is the first woman to be asked by a Pontificial Dicastery to defend the cause of canonization, and one of the few female postulators in the world. She is currently reviewing upwards of 20 beatification cases, including the Servant of God Luisa Piccarreta. In order to open the beatification process, five years have to pass after the candidate’s death. This time period is necessary to evaluate if this person’s saintly legacy is kept alive or forgotten. The next step involves gathering testimonies from people who knew the person in order to demonstrate their virtues with concrete facts and not just opinions. With this information, a detailed biography called “Positio” is compiled. The postulator will ultimately have to prove a miracle occurred in order to validate that the candidate intercedes between man and God. The Church considers this a sign from God that certifies that this person is in Heaven. The last step before being canonized is being beatified, which means that a person can be venerated in their diocese. In order to declare someone a saint, an additional miracle has to be proven. Every time that someone is proclaimed a new saint, it is a milestone marking the end of years of work from a postulator and his or her staff. Dr. Correale says it is like giving birth: you suffer a lot but in the end it is a great joy. Pope Emeritus Benedict XVI said that saints are like the jewels that adorn the Church. Because of this, the work of the postulators like Silvia Correale is like that of a goldsmith, whose vocation is about making each and every one shine. In October 2005 at the end of the closure of Luisa’s cause by the Archdiocese of Trani, all official documents were packaged and sealed for shipment to Congregation for the Causes of the Saints – the dicastery, or department, of the Roman Curia responsible to the Holy Father for the investigations which lead to the beatification and canonization of holy men and women. On March 7, A.D. 2006 these packages were officially opened by the Congregation for the Causes of the Saints. In attendance was the Postulator of Luisa’s cause, Silvia Monica Corrales, who was appointed by the Congregation to represent Luisa’s Cause. Thus began the “Roman Phase” of Luisa’s Cause. One of the most important missions on the face of the earth. Fiat!